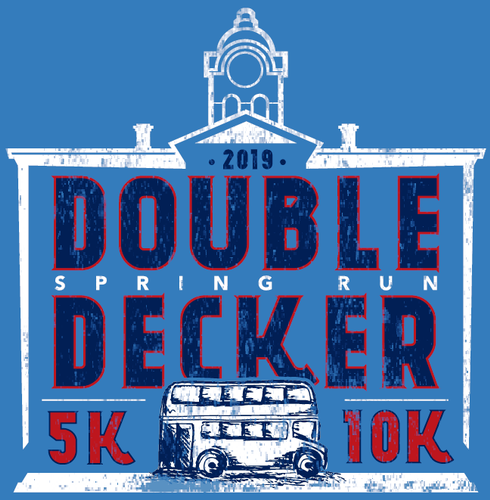 Double Decker Spring Run - Apr 27, 2019 - Oxford Mississippi ? Plans are underway for the 24th Annual Double Decker Spring Run, sponsored by the Oxford-Lafayette County Chamber of Commerce. This year's 10K Run, 5K Run, and Kids Fun Run are scheduled for April 27th, and we want you to be involved! The Double Decker Spring Run is proud to partner with Baptist Memorial Hospital-North Mississippi as our title sponsor for the 24th year in a row! Our race has grown to over 1,600 racers last year who came to Oxford from all around the region, and we expect that number to continue to climb this year. The Oxford-Lafayette County Chamber of Commerce is excited to once again partner with Start2Finish to bring you this year's race. Start2Finish is the premier health-oriented event management company in the Mid-South. S2F takes pride in producing events that allow Mid-South residents and area visitors the opportunity to challenge themselves, achieve goals and most importantly have fun! With their assistance, and our ready team of volunteers, this year's Double Decker Spring Run is sure to be fun for the whole family. For more information on the race or to register go to www.doubledeckerspringrun.com now! Kids Fun Run: 9 a.m. There is only one title sponsor for this event. Baptist has been our exclusive title sponsor for 24 years running! Many thanks to Oxford Orthopaedics and Sports Medicine for your commitment at the Elite Level! Logo featured prominently on Spring Run t-shirts. 2,000 shirts will be ordered and will be given to all Spring Run participants, sponsors, and volunteers. We will also get you some shirts for your staff, depending on how many extras we have after the race. Logo featured on advertising and promotions. Logo featured prominently on Spring Run banner to be displayed at the Spring Run. Logo featured on masthead of Double Decker Spring Run Facebook page. Logo featured on the Spring Run website www.doubledeckerspringrun.com. Sponsor featured on multiple Facebook, instagram and twitter posts on race event page, exposure to 3,000+ contacts. Logo featured on sponsor recognition sheet in participants goody bags. Includes 8 comped race registrations. Option to put promo item in swag bags. Logo featured on mass e-mails about Spring Run. Multiple e-mails distributed by Start2Finish, Distribution 30,000+ in region each time. Multiple e-mails distributed by Chamber to Chamber's mass email list, Distribution 1,200+ each time. Multiple e-mails distributed by Chamber to last year's race participants, Distribution 1,700+ each time. Logo featured on Spring Run t-shirts. 2,000 shirts will be ordered and will be given to all Spring Run participants, sponsors, and volunteers. We will also get you some shirts for your staff, depending on how many extras we have after the race. Business name featured on advertising and promotions. Includes 6 comped race registrations. Business name listed on Spring Run t-shirts. 2,000 shirts will be ordered and will be given to all Spring Run participants and volunteers.We will also get you some shirts for your staff, depending on how many extras we have after the race. Logo featured on Spring Run banner to be displayed at the Spring Run. Includes 4 comped race registrations. Business name listed on Spring Run t-shirts. 2,000 shirts will be ordered and will be given to all Spring Run participants and volunteers. We will also get you some shirts for your staff, depending on how many extras we have after the race. General Sponsor listing on Spring Run banner to be displayed at the Spring Run. Listing on sponsor recognition sheet in participants goody bags. Includes 2 comped race registration. Sponsorship listing in mass e-mails about Spring Run. A business can set up a tent/display at the race, to be visible to the 1700-1800 racers, and hand out collateral materials. We will provide a 6 foot table and two chairs. Questions contact Pam Swain at 662-234-4651. Logo featured on Food Donor sign to be displayed at the Spring Run. Listing included on sponsor recognition sheet in participants goody bags. Food sponsors may donate any amount of food, with all total food donations to feed approximately 1,800 participants. It is not necessary for each donation to feed the total amount of participants. Any amount of food donations will be accepted and appreciated. Ideas include: soft drinks, Gatorade, fresh fruit, nutrition bars, cookies, sandwiches, etc. Sponsorship of a water station for the Spring Run, at a location assigned by the Spring Run committee. Requests for specific locations are accepted, but not guaranteed. The Chamber will supply and deliver all necessary materials, including: water, cups, coolers, table, garbage cans, and trash bags. Sponsor is responsible for: staffing of station (at minimum of 4 people), optional company tent and signage, music, etc. Water station sponsorships are a great way to add excitement along the course, and to get some extra publicity for your cause or business. Water station sponsors are encouraged to be creative with their station. Ideas include: live music, cheerleaders, themes, etc. Goody Bags - Would you like to include something in the 1,800 SWAG BAGS each racer receives? The Chamber is currently collecting items to fill the bags. Each entrant will receive a "swag bag" filled with items at registration. The sturdy nylon drawstring backpacks are graciously provided by our presenting sponsor, Baptist Memorial Hospital-North Mississippi and Oxford Orthopaedics and Sports Medicine. The deadline for us to receive goody bag materials is Friday, April 19th. We need 1,800 of your items, to ensure we have enough for all the registrants. We will be glad to pick the items up from you or you can drop them off at the Chamber office, 299 Jackson Avenue West. All goody bags donors' names will be included on a donor list in each participant's bag. Great publicity for you!! Suggested items include, but are not limited to: cereal bars, pens, notepads, rulers, flashlights, calculators, key chains, pedometer, etc. Or you may choose to put paper items in the bags. Please make sure all flyers are for coupon use only. No general flyers. Let me know if you have any questions. Thanks!! !